How to stream the screen in C#? This guide describes how you can capture your screen real time by using Ozeki Camera SDK. To use this feature, OZEKI Camera SDK has to be installed and a reference to OzekiSDK.dll has to be added to your Visual Studio project. How you can use screen capture? 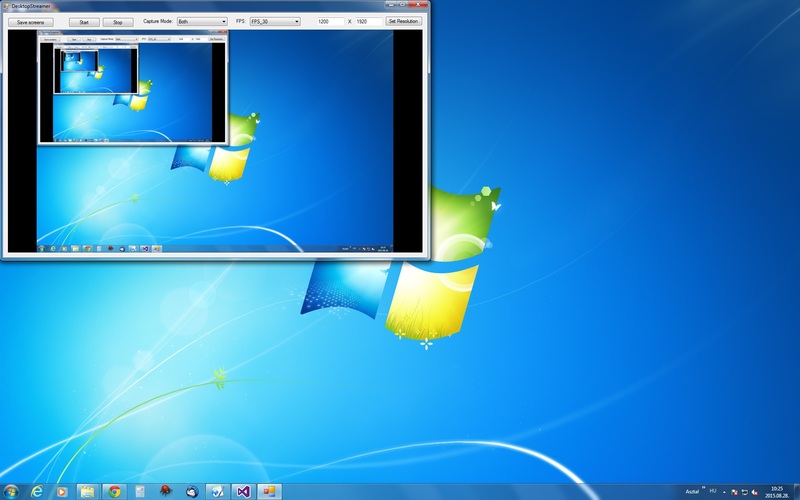 Desktop streaming or screen capturing offers the opportunity to record the desktop of a used PC. This way it is possible to record the desktop and trace all changes made on the followed PC. This feature is very useful for security companies, public Internet access spots and workplaces with highly sensitive data. It can also be used for education due the teacher can revise the work of the student by using OZEKI Camera SDK. ScreenCapture uses the ScreenCaptureFPS and DesiredResolution properties to calibrate the quality of the stream. It is also possible to focus to a given area of the screen by using the Rectangle property. Here you can find a detailed explanation of all the used properties. DesiredResolution: This property specifies the resolution of the video stream. By setting this value lower it is possible to use ScreenCapture with networks having lower bandwidth. DesktopResolution: This property specifies the resolution of the desktop. It can not be modified by the user. Mode: This property specifies how to stream the screen from three choices, which decides that the screen is shown without mouse, only mouse, or both of them can be seen. Rectangle: By using this property it is possible to focus to a defined area of the screen and stream only that. This property is composed of four separate values called X1, Y1, Width and Height in this tutorial. X1 and Y1 specify the coordinates of the bottom left corner of the rectangle desired to be captured. Width and Height are the width and the height of the rectangle which borders the captured are. E.g. if X1 and Y1 are 0 and Width and Height are the Width and the Height of the desktop the entire screen will be displayed. ScreenCaptureFPS: This is an enum type property which lets you to adjust the frame per second of the stream. It has a maximum value of 30. You can set its value to 1, 5, 10, 15, 20, 25 and 30 by default. This methods starts the desktop capturing. It is possible to stop the capturing by using this method. This static method returns all screen's properties which connected to the PC. This static method merges all screen's view connected to the PC, and saves a picture this way. The queue of the merge method is decided by the identifier of the screens. After you have downloaded the Ozeki Camera SDK software you can find the GUI code in the Example folder. Please note that this function essentialy displays a desktop and contanins no controllers. After learning the examples and information of this webpage you will be fully familiar with the concept and usage of desktop streaming. By using our example code and the functions discussed above you can install desktop screening to your C# camera application using the Ozeki Camera SDK. How can I increase the quality of the stream? Please increase the value of the DesiredResolution property. What can I do if the stream is very slow or lagging? Please decrease the value of the DesiredResolution property and increase the value of ScreenCaptureFPS to 30.